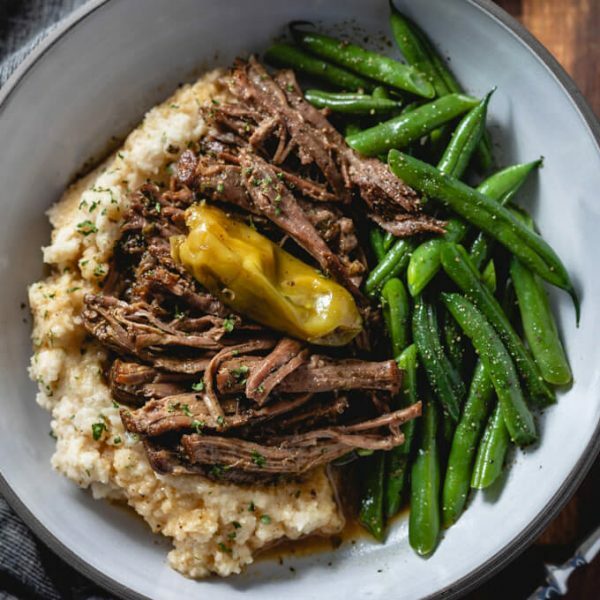 Mississippi pot roast is a popular slow cooker recipe that creates big flavor out of a few simple ingredients. My version results in a fall apart tender roast with a rich and flavorful sauce and uses NO PACKETS. Low carb and keto recipe. 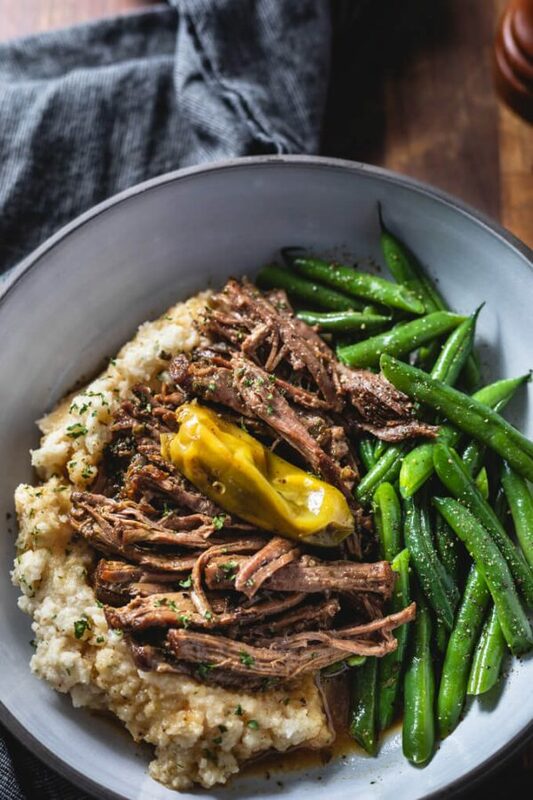 Some of you are wondering, “what is Mississippi Roast?” The original recipe for Mississippi roast or pepperoncini pot roast, is a chuck roast seasoned with a packet of ranch seasoning mix, a packet of Au jus gravy, several pepperoncini peppers and a whole stick of butter. It can be cooked on the stove, in the oven, or in a pressure cooker, but it’s most often made in a slow cooker. The first time I made Mississippi pot roast, I followed the original recipe. Yep, I bought the ranch seasoning packet, Au jus packet, a jar of pepperoncinis, and used a whole stick of butter. I cooked it in my slow cooker and it was good, but it wasn’t great. The flavor wasn’t quite where I wanted it and there was an inch of oil floating on top of the gravy! I was a little disappointed. I knew it could be better. I worked really hard on a copycat homemade ranch seasoning mix. The first version included powdered buttermilk and nutritional yeast, which was really good. But in the end, I decided to simplify the ingredients and came up with a homemade version that I think is even better. It made all the difference in my Mississippi roast recipe, which is also low carb, keto, and gluten-free! By the way, you’ll probably want to use this ranch seasoning mix on everything – I do. I’ve already used it on Tangy Ranch Chicken Wings, to make homemade ranch dressing and dip, and used it to make Mississippi chicken and pork roast. All were delicious. The night I perfected this roast, I broke it into large chunks and served it and the rich gravy with roasted rutabaga. It was a low carb match made in heaven! My family couldn’t get enough. I shredded the leftovers and served it as french bread sandwiches for my kids and I made low carb rolls for my husband and myself. Super great! 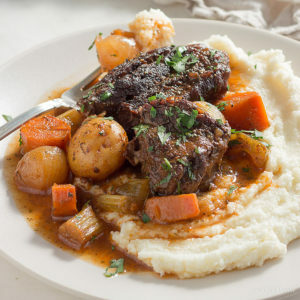 What to serve with Mississippi Roast? Traditional sides like potatoes, cooked carrots, green beans, and rice, are perfect to serve with Mississippi Roast. 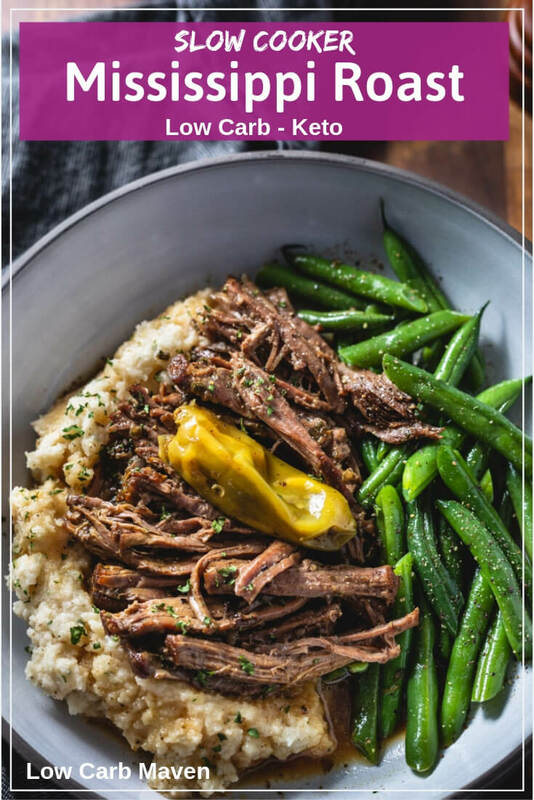 For low carb keto options, try serving with cauliflower broccoli rice, cauliflower pilaf, mashed cauliflower, roasted turnips, or my favorite…. Roasted rutabaga! I would even serve it over keto noodles (fried buttered cabbage). In the photos I served the roast with mashed buttered turnips and green beans. 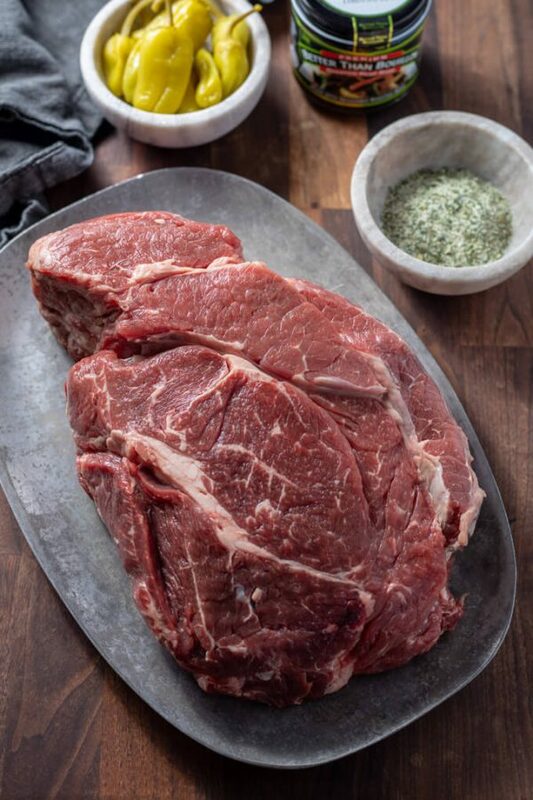 Trim away surface fat from the outside of the chuck roast and any large pockets between muscles. Rub 2 teaspoons of oil over the roast and season with salt and pepper. Place a medium-large frying pan over med-high heat. When hot, add the remaining 1 teaspoon of oil and tilt the pan to distribute. Brown the roast well, on both sides. Remove the roast from the pan and place into the slow cooker. Turn the heat under the pan to low. Add the water and beef base, scraping any browned bits from the bottom of the pan. Pour into the slow cooker at the sides of the roast. Sprinkle 2 teaspoons of the Homemade Ranch Seasoning over the roast. Dot with pieces of butter. Lay pepperoncini on top. Cook on high for 4-6 hours or on low 6-8 or until the roast pulls apart easily with a fork. Cooking time will partly depend on the make of your slow cooker, the size and shape of your roast, and whether or not you brown the roast. Serves 6-8. Nutritional information is for 1/6th of the roast and 1/6th of the gravy/juice.